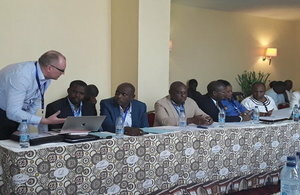 The workshop from 2 to 4 April addressed issues on cybersecurity and cybercrime in Cameroon, national critical assets identification and the protection of critical cyberspace. Speaking at the opening ceremony of the workshop, the General Manager of the [National Agency for Information and Communication Technologies (ANTIC)[(https://www.antic.cm/index.php/en/) Prof. Ebot Ebot Enaw highlighted the severity of cybercrimes in Cameroon amongst which scamming, phishing, identity theft through the creation of fake social media accounts, web defacement and skimming. Furthermore, with the exponential growth of internet usage in Cameroon Prof. Ebot said there have been more than 1400 cases of scams, over 2000 cases of phishing especially with mobile money transfers, 32 government agencies and ministries web defacements and several local banks have suffered considerable financial losses estimated at over £4.8 million.